With the tenor of "Water World" and "Mad Max," fire-breathing dragons attack the few remaining humans as they huddle together in an English castle, 2020AD. 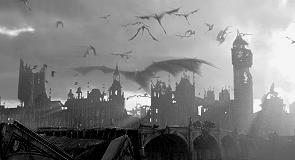 During a routine dig in London, crews awaken an unhappy dragon living in the ground, thus releasing a wrath of hell and fire that pretty much demolishes everything worldwide. This, the film breezes through all in the first ten minutes or so using voice over explanation and cheesy newspaper/mag headlines: "The End?" Fast forward twenty years, Quinn (Bale), with a sharp mind, firm hand and working class manner, leads a small band of castaways. Enter "The only thing worse than a dragon -- An American!" Matthew McConaughey as soldier Van Zan, buff arms bulging out of a sheepskin-lined leather jacket. His head shaved to stubble, short cigar breaking out of his scruffy beard and eyes bulging and watery, "Envy the country that has heroes and pity the one that needs 'em." Bale is strong, but it's McConaughey's insane passion to slay dragons that breathes fire into the ruins and rubble. He's a cartoon made real. On a few occasions, the dragons themselves are rather spectacular. And, though it ends anti-climatically, the helicopter/skydiving team vs. dragon sequence is pretty cool. Mostly superficial, the film shows depth on two occasions: the bout between Quinn and Van Zan which displays more drama than the special effects can muster and Quinn's reaction to children huddled in the basement (choked me up a bit actually). Also, easily the most crowd pleasing scene, Quinn and best friend (I know he's Quinn's best friend because he announces it so) reenact a crucial scene from "Star Wars" simply to amuse the refugee kids. Those are the highlights. However, in general, I have a hard time understanding why the humans use guns when the guns prove over and over to be useless. And if "The dragons don't want us, just the ashes from the field" why do they chase the humans all the time. And why did the small castle colony plant their vegetable garden miles from their castle? And where did they get the food to feed the horse when people were supposedly starving to death? And if they reproduce like fish, why would one assume there was only one male? And why are they now "more dangerous than ever" after the entire world's been destroyed? And that's the short list of questions, not to mention more than a few convenient contrivances (I'll leave unmentioned as not to spoil). 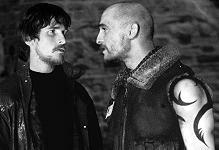 Reign of Fire. Copyright © Touchstone 2002. Rated PG-13. Starring Christian Bale, Matthew McConaughey, Izabella Scorupco, Gerard Butler. Screenplay by Matt Greenberg, Terry Hayes. Produced by Richard Zanuck, Jonathn Glickman, Lili Fini Zanuck, Gary Barber, Roger Birnbaum.